Gilbert Melendez’s decorated MMA career could be coming to an end. 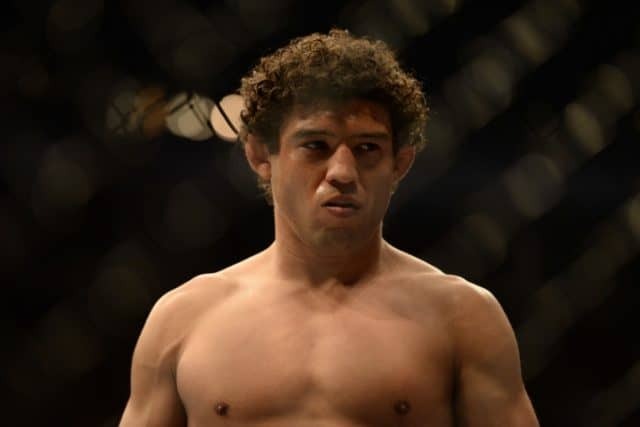 News broke today that Melendez is reportedly in talks to end his lengthy layoff to face Arnold Allen at December’s UFC 232 according to an anonymous source who confirmed the talks to MMAjunkie.com. The fight was first reported by FloCombat. Melendez recently confirmed that he was ending a yearlong hiatus since a brutal beating at the hands of feared knockout artist Jeremy Stephens. The bout was contested at featherweight, Melendez’ first bout at 145 pounds since 2003. The former Strikeforce lightweight champion and UFC title challenger was once one of the top 155-pound fighters in the world. He won the Strikeforce lightweight title twice and defended it five times in total to storm into the UFC in 2013. He met then-champ Benson Henderson for the title and lost a close split decision. ‘El Nino’ then won a brutal, bloody war with Diego Sanchez at UFC 166 to earn a second UFC title shot at UFC 181 in December 2014. Melendez was submitted by former champ Anthony Pettis and went on to lose three straight fights to Stephens, Edson Barboza, and Eddie Alvarez to put his overall UFC record at a disappointing 1-5. With the losses mounting to the best fighters in the world, ‘El Nino’ admitted he needs to win his next fight and win big. If he does battle Allen, he’ll have no easy task. The 24-year-old featherweight was last seen submitting Mads Burnell at May’s UFC Liverpool. He boasts four wins in a row in the UFC and an overall MMA record of 13-1. Will Melendez continue his storied career past UFC 232?